Fast and complicated calculations are a product of fossil fuels. Multiplying and dividing numbers was not always that easy. 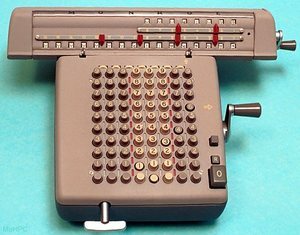 Before the arrival of cheap electronic pocket calculators and computers in the 1970s, people relied on an array of low-tech means and machines to calculate taxes, profits or the properties of engineering parts. Being an obsolete technology now, some of these 19th and 20th century calculators are surprisingly sophisticated and fashionable. Moreover, most are powered by a crank, which makes these gadgets "green". Today's pocket calculators are no power hogs, either. The thing is that computers took over most calculating jobs from calculators, and a large supercomputer consumes as much energy as a convoy of trucks. What do we do with all that calculation power? We build fast cars, giant jumbo jets and worldwide information highways, all of which, in their turn, raise energy consumption. We also construct opaque financial products, rickety electronic voting systems and contradictory global warming scenarios. Mechanical calculators may be an inferior technology, but they had the benefit of keeping things on this planet relatively simple. A brief overview of the most remarkable models. For most of history, people relied only on their brains when they had to make a calculation. The idea that a machine could count, was unheard of. 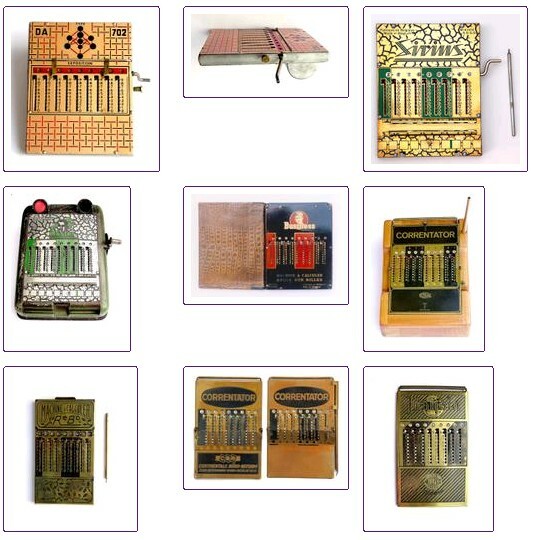 The abacus, the only instrument which has been available for some thousands of years (and is still being used in some places), is not really a calculation machine but a memory aid, similar to the writing down of a calculation. Things changed in the 17th century, when John Napier invented logarithms. With a logarithm, a multiplication can be transformed into an addition (and a division into a subtraction). That makes it much easier to translate calculations into a mechanism. The first mechanical calculation machines, developed by Wilhelm Schickhard, Blaise Pascal and Gottfried Wilhelm von Leibniz, were not much of a success since they were not very reliable. But they became the basis for the highly successful mechanical calculators built throughout the 19th and 20 century, when more accurate gears and wheels became available. Mechanical desktop calculators resemble old typewriters, both in their size, weight and operation. The machines had movable carriages and/or rows of keys. They were an important tool in business and administration for more than 150 years, especially from the 1900s until the beginning of the 1970s. The first reliable machine was the Arithmometer invented by Charles Xavier de Colmar in 1820. The concept was improved with the impressive pinwheel calculators (picture below right) invented by Baldwin and Odhner (here you find the mechanism and the manual - scroll down the page - of a Pinwheel machine). 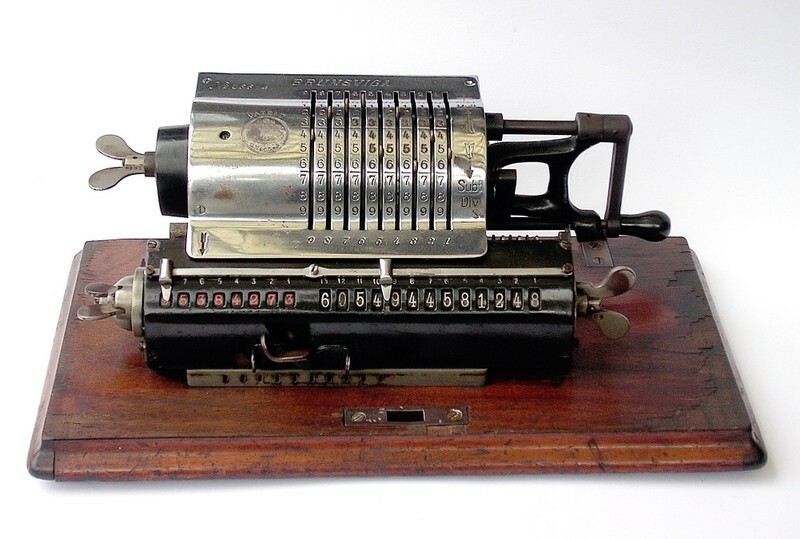 The Comptometer, introduced in 1885, was the first mechanical calculator in which numbers were entered (and processed) by pressing keys, which made the operation of the machine easier. Instead of having 10 keys for the numbers from 0 to 9 (like the keyboards we use today), these "adding machines" had columns of 10 keys each, to introduce successively units, tens, hundreds, and so on. The most "powerful" calculators had up to 20 columns in their full keyboards. This is how they worked (picture left: mechanism of a comptometer). Multiplying and dividing required several operations and could take some time. The keyboard of adding machines was better for fast additions and subtractions, while the carriage of the pinwheels was better for multiplying and dividing. Some machines (like the one pictured above) combined both technologies. 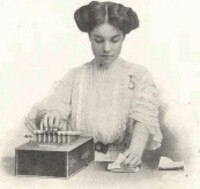 Electric (not electronic) driven calculators became common in the 1940s, but hand driven calculators remained popular because they were quieter, smaller, lighter and cheaper. 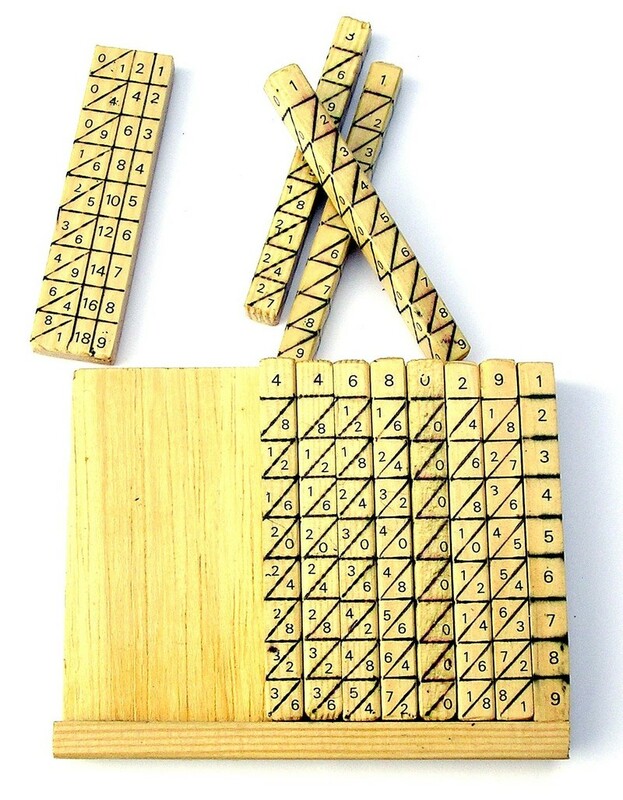 Napier bones and slide rules, both based on the concept of algorithms logarithms, were invented in the 17th century. They remained the only portable calculation aids until the Arithmographe, invented in 1889 by the Frenchman Troncet. Of this device, which was soon known as a "Troncet", millions were sold. It was on the market until the 1970s. 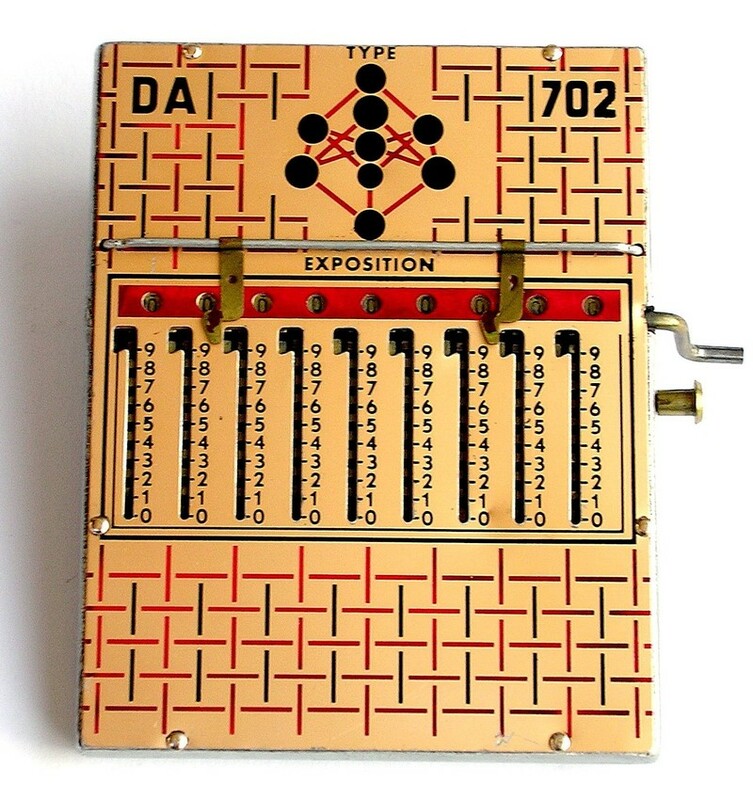 These calculators had very diverse and fashionable designs, not unlike a mobile phone or an mp3-player today. Both cheap and extremely expensive models existed. Some of them were operated with a small metal pen, like a PDA now. The machines were later known as Addiators, after a brand that was created in Germany in 1920 (and was on the market until 1982). Some marvellous photo collections of Troncets and Addiators can be found here and here. A good description of the workings of the device can be seen in this scanned manual from a very popular device in the US, the Baby Calculator. 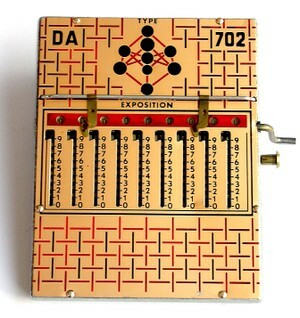 Contrary to slide rules, these "slide adders" were digital devices, but their mechanism is more related to slide rules and the abacus than to mechanical calculators. The Curta was the first (and only) portable mechanical calculator. 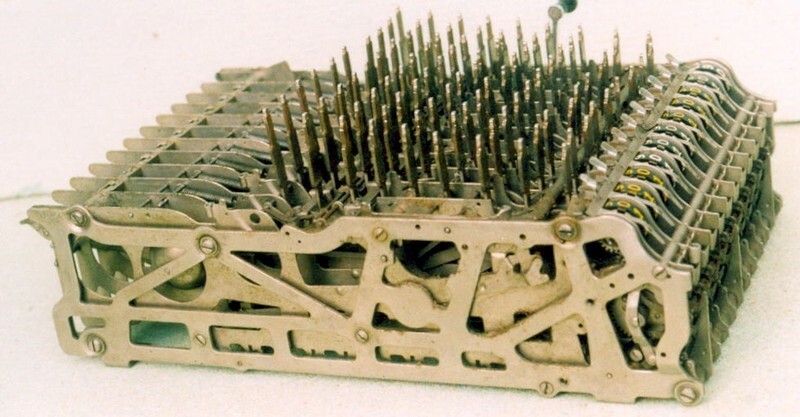 Designed by a prisoner in a concentration camp, it became the most precise portable computer until the arrival of electronic pocket calculators (with 11 to 15 digits it is even more accurate than most simple electronic models today). 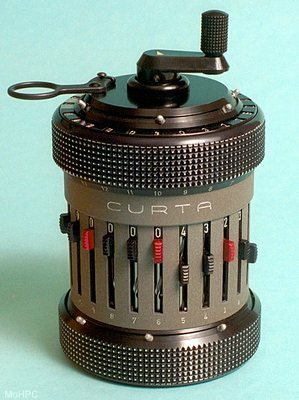 The Curta was introduced in 1947, the last models were produced in 1970. The Curta works according to the same principles as the mechanical desktop calculators, but its mechanism is much more compact - the device fits in the palm of your hand. The Curta combines low-tech sense (operated by a crank, built to last) with high-tech precision (see how it works and how it looks when you take it apart). The only advantages of an electronic calculator over the Curta are portability (an electronic calculator is even smaller) and speed - a not too complicated multiplication or division can take up to a dozen of cranks. Owners of the device say that turning the crank is a real pleasure due to the excellent gearwork. Later models could also perform squares, cubes, percentages and cosines. About 140,000 Curta's were built. More information on this device can be found here and here. UPDATE: operate a virtual curta online (via). All calculating devices mentioned above were not suited for very complicated calculations, like those needed by science and navigation. Until the 1960s, complicated computations were done with the help of mathematical tables, where one can look up the result for every possible calculation that might be needed (they are still used for some complex calculations, also in computers, where they can increase calculating speed). These columns of numbers - similar to simple multiplication tables - were made by teams of people, called "computers", who were calculating all day (often using the machines mentioned above). Producing those tables was labour-intensive and prone to mistakes. The English inventor and mathematician Charles Babbage took up the plan of automating this process. He designed a machine that would handle numbers of up to 33 digits and that would print the results, so that not just calculation mistakes but typographical mistakes could be avoided, too. He presented his first design in 1822 (The Difference Engine no.1) and a second one in 1849 (The Difference Engine no.2 - find the complete scanned designs here). In between, he completed a design for the first computer ever (The Analytical Machine, in 1834), which was meant to be driven by steam power. 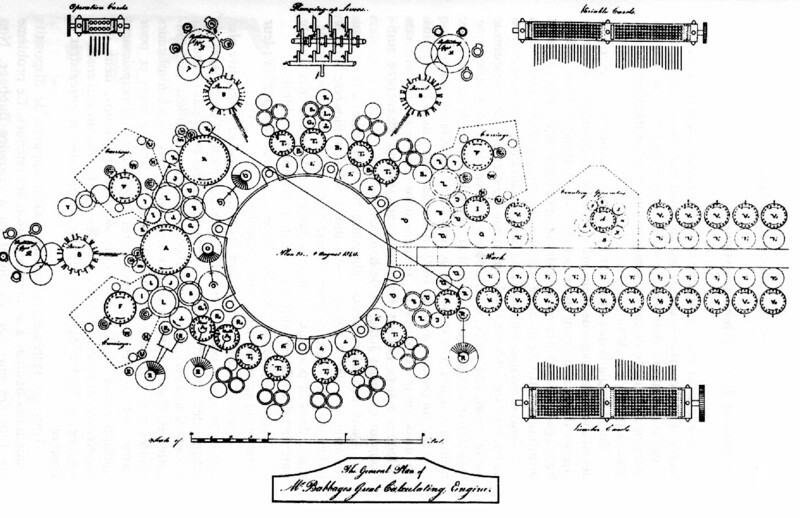 Babbage never built his machines, except for some parts, but other people did. In 1853, father and son Scheutz from Sweden completed a smaller version of the difference engine and in 1875 Martin Wiberg built a version the size of a sewing machine. A 5 ton replica, based on the original plans of Babbage, will be on display for a year in the American Museum for Computing History, starting this weekend. Another one can be found in the London Science Museum (both museum pages contain pictures of the machines). These are the largest mechanical calculators ever built; the counterparts of the Curta. A good explanation of the importance of Difference Engines can be found in this chapter of "Computing before computers" (heavy download). 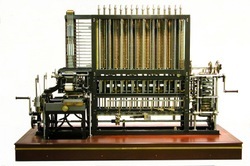 The Difference Engine shows both the marvels and the limitations of mechanical calculators. The reliability of a mechanical computer depends on the accuracy of the gears, and the heavier they are, the better. Some people have built Difference Engines with meccano or lego bricks, but those machines deliver less precise results because of the higher flexibility of the lightweight parts. Constructing a mechanical computer with the calculation capacities of a modern computer would create a monstrous machine, larger than our largest buildings, that would have to be cranked several generations long to produce a result. The Difference Engine , a novel by William Gibson and Bruce Sterling: what would have happened if the information revolution had started in the 19th century? I am studying the machine of Wilhelm Schickard and found lowtechmagazine.com to be a very intersting resource. Thank you for putting all that together! However in this article there is something I do not understand. The heading "1. Logarithms (1614-2008)"
mentions that Napier "invented" logarithms. But the picture shows one of his other inventions, the napier bones. I have a set of them, and quite well understand how Schickard integrated them into his machine. The bones and Schickards machine do not use logarithms at all. Logarithms are a way of reducing one multiplication to one(!) addition, but it comes with a loss of precision. The machines reduce a multiplication to a series of addition without any loss of precision. Further down the text says that "Napier bones and slide rules, both based on the concept of logarithms, were invented in the 17th century." Attributing Logarithm to John Napier is correct. https://en.wikipedia.org/wiki/Napierian_logarithm has the details. Obviously unrelated to the bones. I'd appreciate if you could add this distinctions to the website.